Top/Shirt : Aqua multi chiffon heavily embellished shirt is empire line and box pleats under-bust. Scoop neckline. Embellished straps. Aqua mist plain back. Hidden zipper closure back. Fully lined. Bottom/Sharara : Poppy chiffon two legged sharara there Godet from the kneecap making each flared late. Front slit opening on each layer with heavy embellishments around and on the waistband. Small motifs made all over. The top layer leaving the textured effect due banarsi jamawar inside layer is having heavy floral print. Hidden side zipper closure. Fully lined. Veil/Dupatta : Chiffon dupatta having tie n dye diagonal stripe effects. The dupatta is having three highly embellished borders. The first belt is made of dark cherry color. The second embellished belt is pale turquoise. The third belt is poppy color. Center for dupatta is having embellished motifs with sequins spray all over. Finish by lining the edges. Embellishment work includes sequins, pearls, kora, dabka, twisted thread flowers, Swarovski crystals, diamante, badla and kamdani. An amazing bridal gown. Made in Pakistan. 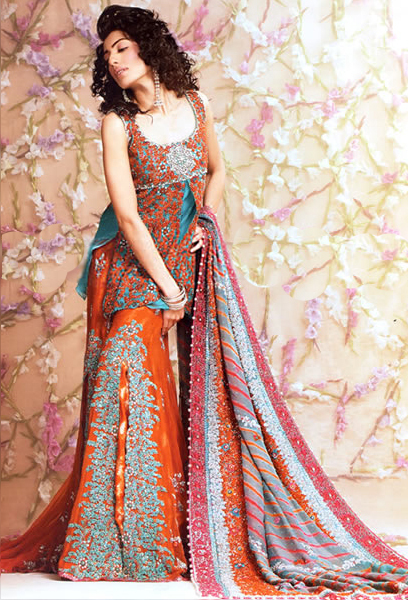 Click the button below to add the BW8788 Aqua Poppy Sharara to your wish list.